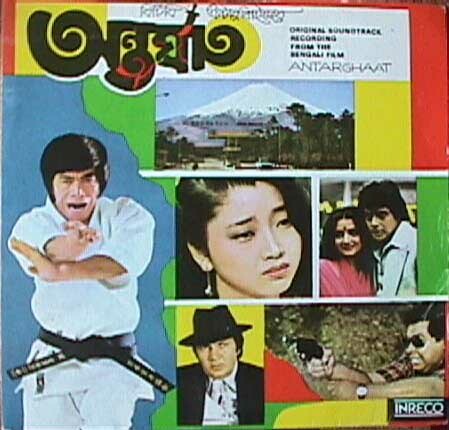 Originally the film was supposed to be called "Antarghaat" and a record (Inreco 222800537) was released in 1980 with that name. After that nothing much happened and I guess the whole project was buried until it suddenly reappeared with a new name called "Swarnatrishaa". The film ran for a couple of weeks and a cassette with the songs of 'Swarnatrishaa' was released around 1992/93. The Hindi version of this film "Aakhiri Badlaa" (originally called "Sabotage") was also released around the same time and a cassette with the hindi version of the songs was also available for a short while. "Mone poDe sei sob din" is a beautiful song and Kishore sang it with real feeling. It reminds me of the same feeling he had when he sang "Koi hotaa jisko apnaa" in the film "Mere Apne". "O aamaar sojoni go" is a Salil classic. Its melody, its orchestration and the singing of Lata and Kishore makes it a rare and one of the most beautiful compositions of Salilda. Pity the film wasn't a hit.